December 14 – 14 Things What are 14 things your life doesn’t need in 2011? How will you go about eliminating them? 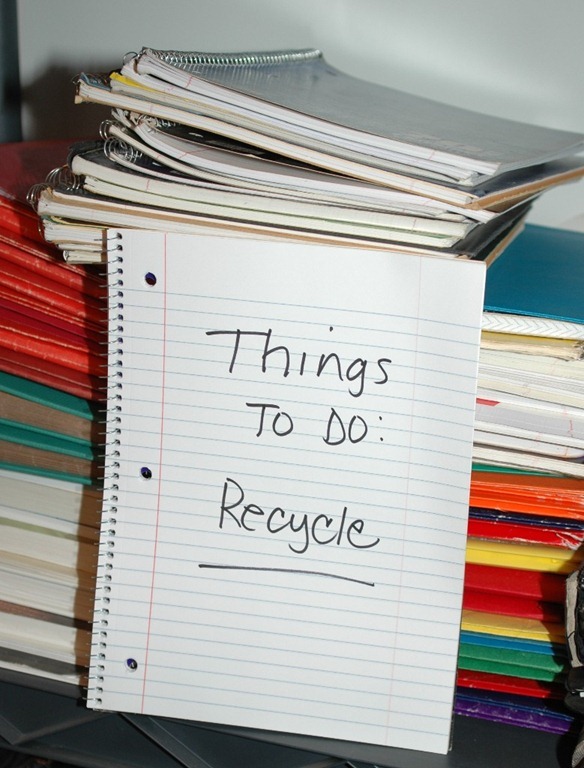 How will getting rid of these 11 things change your life? 1. About 10 pounds. How do I plan to get rid of them? No idea. Nothing fun comes to mind. I guess come spring, when I shed my winter pounds, I plan to run a 5K. That might help. My life will change because I will need a ton of new clothes and people will start to think I have an eating disorder. Yeah, it will be that dramatic. 2. My dependency on Victoria’s Secret for my underwear. They simply don’t make the ones I have loved for years anymore. Thus, I must find another style, another brand, but I can adapt, I know I can. How will my life change? I will again have underwear that doesn’t hang out the top of my jeans, and maybe at the fraction of the cost. No, I wont go thong. I just cant do a perma-snuggie all day. Call it what you want, I don’t do wedgies. 3. 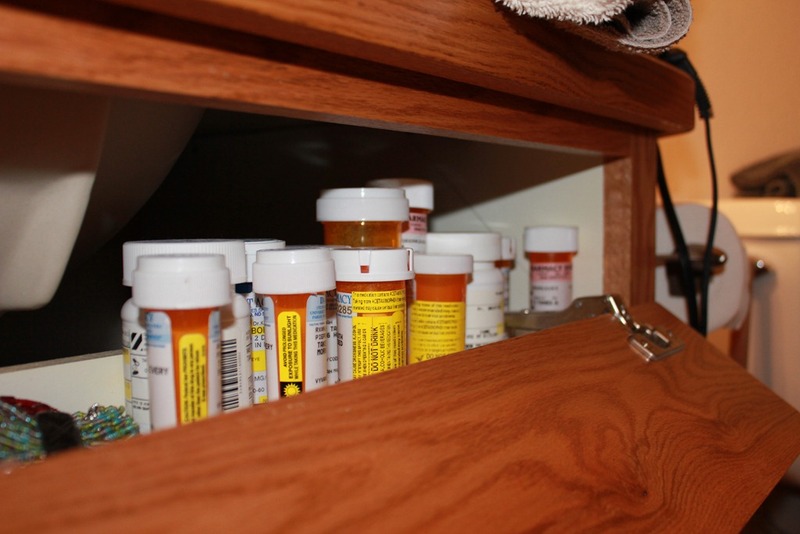 I have oodles of prescription meds in my bathroom. Enough so that if I died of a drug overdose and they listed all the meds found in my house, I would sound all Michael Jackson. Or worse. I don’t know how to get rid of that stuff. I know I am not supposed to flush it, but ya know, I can’t dump them down the drain either. How would this change my life? I guess I would have a cleaner cupboard. And fewer drugs to make for good stories and rehash memories. 4. My life no longer needs a couple of the TV shows I watch. What Not to Wear is a gonner. How will this change my life? 1 more hour of time freed up to do the good stuff like surf the web. I am sure some new shows will come along to replace the old ones…my life will be full of better entertainment. 5. I no longer need a couple of the T-shirts I hang onto because I have had them forever, remember who gave them to me, and blah blah blah. They have holes in the arm pits and I still hang on to them. I am pretty sure that holes in the armpits is some sort of status symbol…not everyone can wear holes into the armpits of their t-shirts. I think that makes me special. Or something. 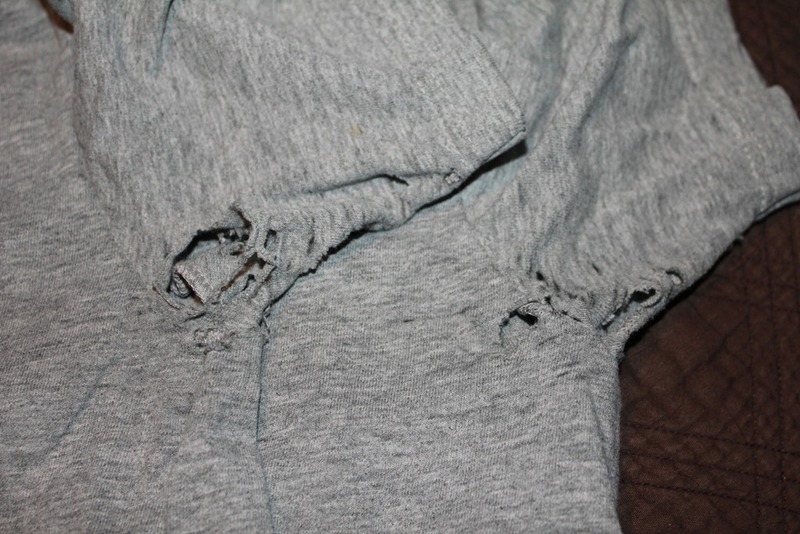 Without these t-shirts, it opens up space in my dresser for all the new clothes I am going to buy because of #1. 6. Picture #5. 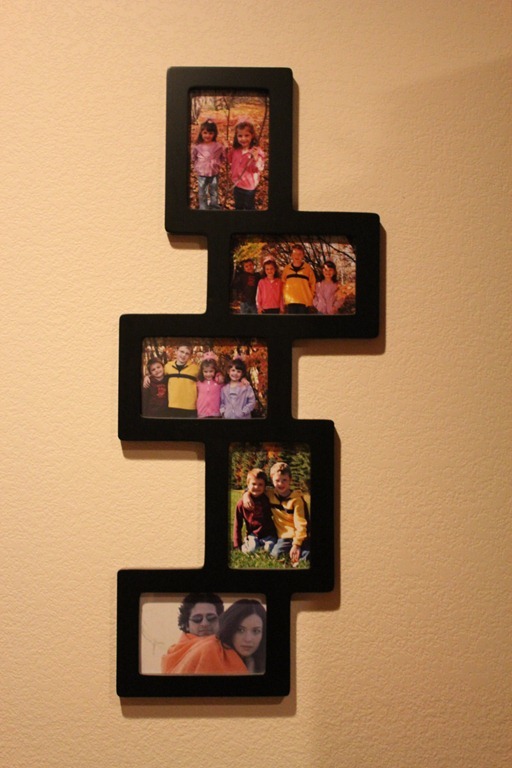 I got this great frame at a Christmas gift exchange, I think it was 4 years ago, and filled the top 4 openings with pictures of my kids, and then, crap, when I printed them I didn’t realize there were 5 openings in the frame, so I left the picture that came with the frame in it until I could get another print done from that day…oh, but we are so used to Uncle Larry and Aunt Julie in the frame at this point, we forget they are there. I guess I will print 5 new ones…so long, Larry and Julie. We will (not) miss you. 7. 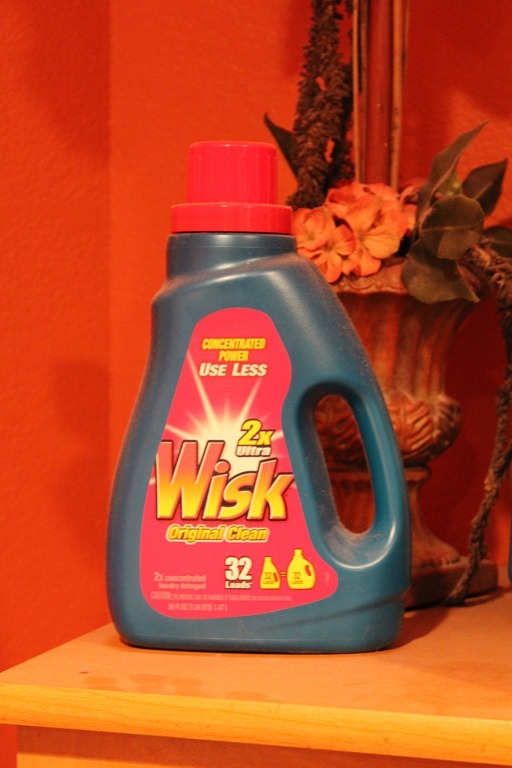 Wisk, how I loved you cuz during my couponing days, I got you for almost free. But now I have a front-loader so I can’t use you, and yet, I allow you to hang around and collect dust. Buh bye. I am sure I can find something else to collect the dust. Life wont change much at all. 8. My recipe box I got for a bridal shower needs to go. 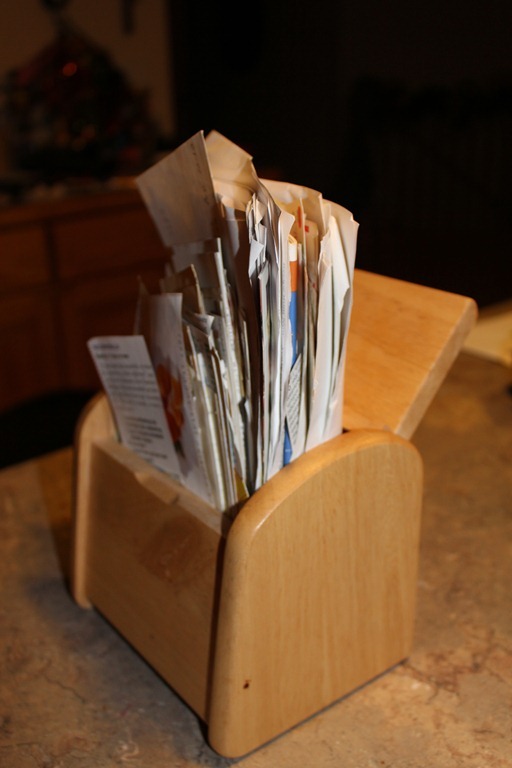 15+ years of collecting recipes has overfilled this thing and every time I go looking for a recipe I just know is in there somewhere, I waste a good 15 minutes. I plan to type them all in, or make a book, or something, I guess. I will let you know. I just know that organizing the recipes will bring order back to the cooking process and I will once again rule my kitchen. 9. 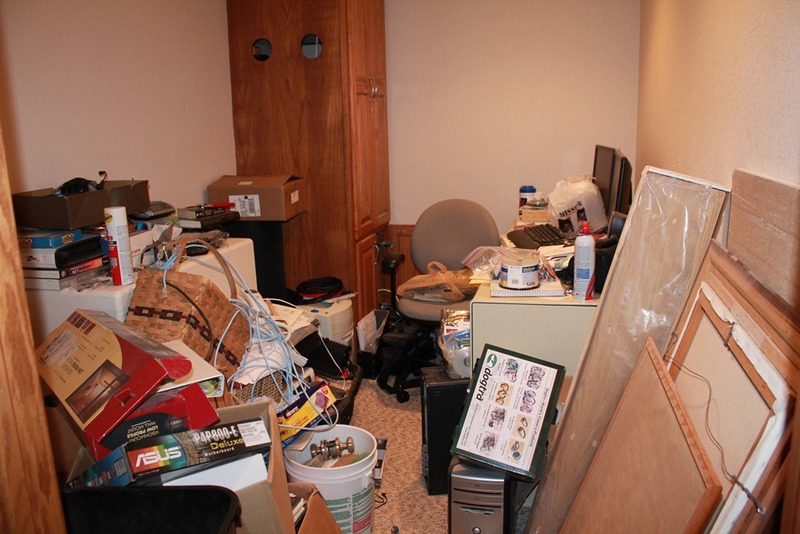 I am pretty sure I can find enough things to finish off my list in this trash heap Bill calls his “office”. (We refer to it as the dungeon and sometimes banish Bill to a day of sitting in there. Wish he would clean it instead of sit there in his tiny techno-heaven watching movies on 4 screens at once.) Just off the top of my head, I see art stacked against the wall on the right – yeah, I think all but one can go. I see another dead CPU, ooo, make that two, and for sure, we don’t need those around. My life would be SOOOOOOO much better if this whole room was gutted and cleaned. Walking past it ruins my mood. I choose to look to the right and greet Uncle Larry and Aunt Julie instead. 10. 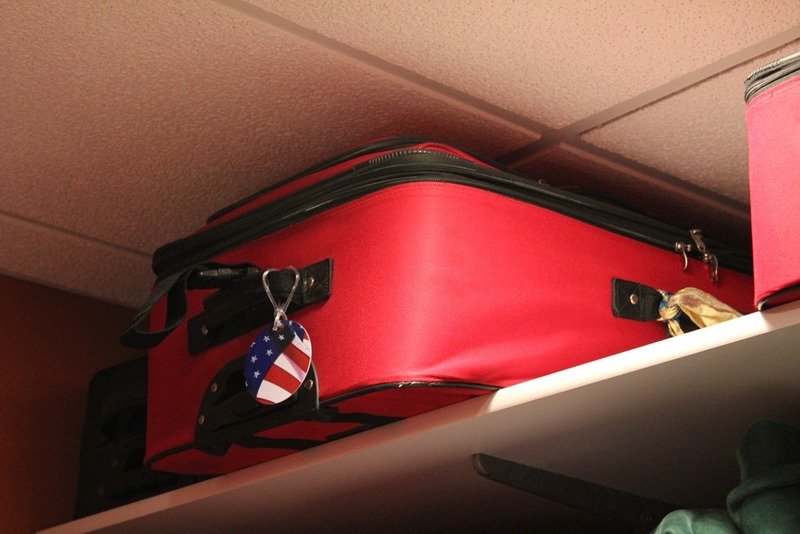 We have a piece of broken luggage. Don’t feel too bad – it was part of a super deal when we got 5 pieces for $50 or something like that. It came to us as a piece of crap, and it needs to leave us as an even crappier piece of crap. Getting rid of it will make room for new luggage. Like that will happen. Like we travel. As if. 11. I need to get rid of a whole bunch of un-matched socks, but really, things don’t just disappear and the mates have to be around this place somewhere. They just have to be. To guarantee I find them, I just need to throw the collection away. You can bank on the fact that probably the next hour, I would find all the missing mates. But I will free myself of the sock collection once again. In my life, it will mean, well, nothing. Just part of a malicious cycle. 12. I would like to have the guts to go through my FB friend list and hack a few off. Why? I’m just like that. In my life it would mean that I am ok not maintaining friendships with everyone I have ever known. I am talking people that would maybe notice their friend count dropped by one, but couldn’t figure out who did the dirty deed. Those kinds of contacts. 13. I have a couple wall decorations that it is time to see gone. Silk plant arrangements are hard to clean, and I would rather chuck them than deal with washing each leaf. Lifetime of the silk plant is almost over anyways. They have time limits, you know. Besides, I saw some cool wall hangings at Gordman’s that I really want and getting rid of the old just makes room for the new. 14. My truck or van…cuz I want a Yukon XL. It may not be a need; after all, more kids have piled into cars way smaller back in the day and not died, but since Uncle Sam, who knows everything that is good for me and isn’t afraid to mandate it, told me that all my kids need to be seat belted in, traveling is not nearly as joyful. Thus, I really would like something that doesn’t push my kids to be naughty whiny little brats while traveling. And no, I wont shove a TV or gaming system in their faces to keep the silence. I can expect good behavior without electronics all the time, that is one of my MAJOR pet peeves. I feel a whole nother blog coming on about that. This would be easier if I could think of 14 things my life DOES need. There are all sorts of intangibles I’d love to get rid of, but probably can’t. Impatience tops that list, but chances I can eliminate that entirely are pretty slim. I’d be all impatient the second I couldn’t get rid of it fast enough. · The craft tote taking up space in the storage closet. Let’s face it- I don’t craft. I will pull out the glue gun (which hubby sometimes uses) and throw the rest away. · Approx 50 notebooks either full or partially full of blank, lined paper. Why am I saving these? I will never use them. · Old school books in my bookcase. Who am I trying to impress? All they are doing is taking up space and collecting dust. · The box of clothespins way up on the top shelf above the washer and dryer. Are you kidding me? Hanging clothes on a line outside to dry? Ha! · My extra hair dryer. I know it is there “just incase”…. but if I did have to use it, it would probably ignite the 4 inches of dust on it and start the place on fire. · My collection of candles. The only time I burn candles is when the house stinks like taco meat. I apologize in advance to all those folks who have given me the candles that I will never, ever use. 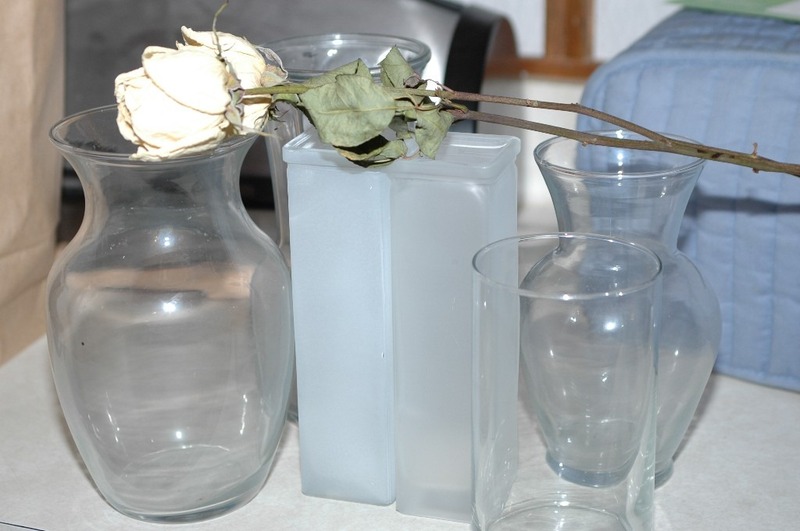 · The half a dozen empty vases I have stored in the cupboard. Unless I get free refills on flower bouquets, these will never again see the light of day. 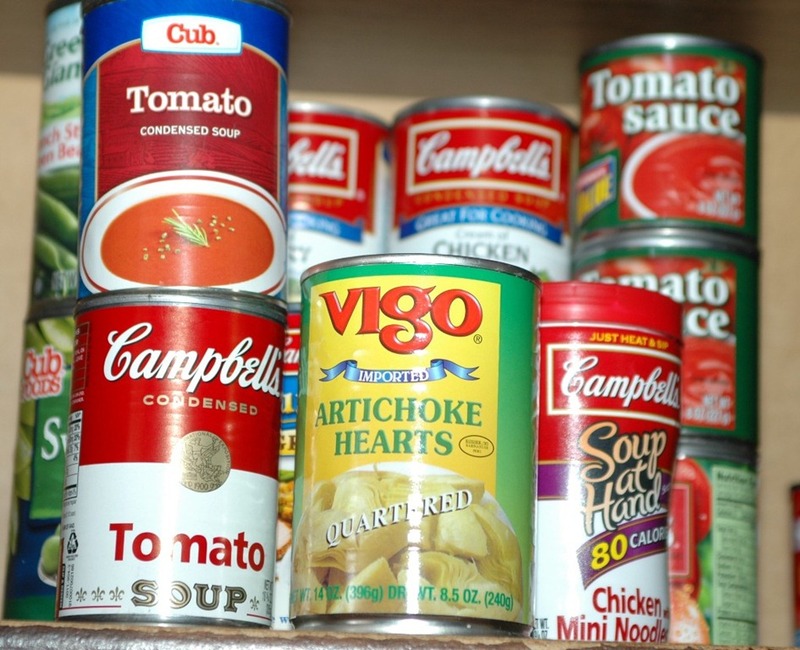 · That random can of generic brand artichoke hearts in the pantry. Not really sure what I was thinking when I purchased that. · My two “identical but different color” back up purses. I bought a new one because I didn’t like them anymore. If I need a back up, I am just going to buy a new one anyways. · The Christmas pins that are in my jewelry box. I don’t wear pins. Have never worn pins. And, if I were to start wearing pins, they wouldn’t be wreaths or Christmas trees. · And speaking of Christmas, the Christmas towels and placemats in storage. I am not a holiday decorator. Have never been a holiday decorator. And, if I need a new hand towel, it will be a solid neutral color. 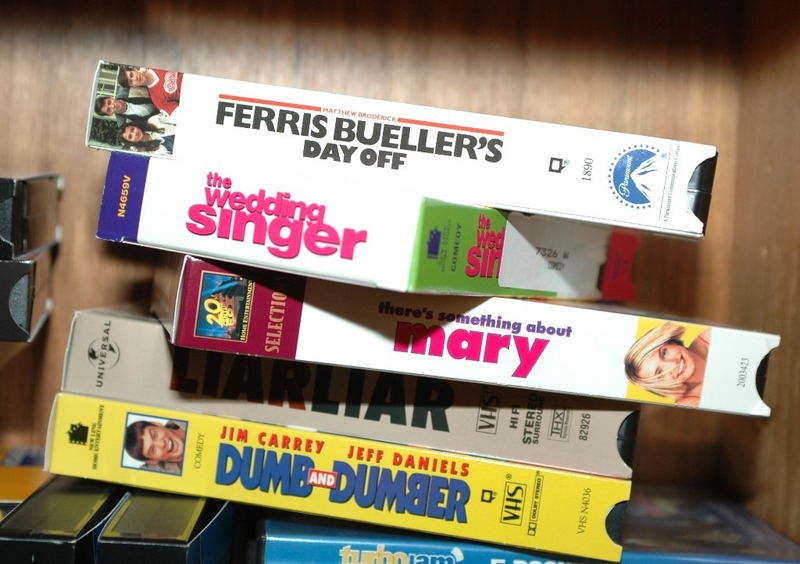 · My “Ferris Buehler’s Day Off” VHS tape. Infact… all of my VHS tapes. They are so 80’s. Time to convert to DVD. Or, better yet, just watch online when nostalgia strikes. · The approximately two dozen assorted sized photo frames that were “so cute” and “such a good deal” that I would someday find just the right photo for. If I haven’t found the right one yet, I never will. · All the empty totes I have sitting waiting to be filled. I won’t need them, since I am getting rid of all of this crap.